Patrice Chéreau’s raw yet elegant Elektra arrived to great acclaim less than two years ago but it returned Thursday evening to the Met to showcase both Christine Goerke as one of the world’s leading exponents of the grueling title role and Yannick Nézet-Séguin as the house’s next Music Director. The latter scored another slam-dunk success while the former left a more equivocal impression. Richard Strauss’s explosive one-act setting of just one more bloody chapter in the chilling saga of the house of Atreus premiered over a century ago but has lost little of its power to shock and disturb. I wasn’t too surprised last night to notice at least five audience members flee fewer than 30 minutes into it. An obsessive yearning for matricide to a lush yet relentlessly harsh score doesn’t edify everyone in quite the same way as the non-stop Puccini parade that has been the meat-and-potatoes of the Met’s repertoire this season. After his driving yet haunting Parsifal Nézet-Séguin turned to another specialty of his predecessor and led the galvanized Met orchestra in a sumptuous, sometimes surprising reading that began slowly but built steadily in intensity to a shattering conclusion. The tense interview between Elektra and an unrecognized stranger churned with riven anguish that evolved to an ecstasy of relief with the revelation that he was the returning Orest. His sister’s cry of recognition bought forth an orchestral explosion of thrilling rapturous release. Nézet-Séguin was most considerate of his singers although occasionally Goerke got drowned out in the big climaxes. The soprano’s puzzling high register has become an increasingly troubling aspect of her singing. One just never knew what was going to come out from one moment to the next. Sometimes a note burst forth big and free but more often it arrived small and curdled wrapped in an edgy vibrato. At the same time her lower voice stunned with an organ-like richness. It was startling to recall that Goerke once sang the high-lying role of Chrysothemis and I imagine she will almost inevitably move onto Klytämnestra. 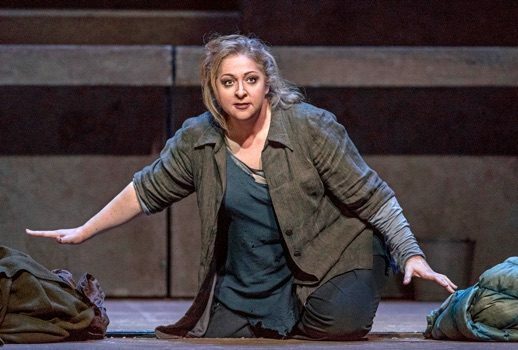 With it so fresh in my memory it was hard not to compare Goerke’s Elektra both with Nina Stemme’s portrayal at the Met in this same production as well as her own triumphant appearance in the role with the Boston Symphony at Carnegie Hall a bit over two years ago. Stemme embodied Agamemnon’s vengeful daughter with an unsparing steely determination whereas Goerke at the Met was more mercurial, more overtly unbalanced. Those who found the Swedish soprano too cool and composed may respond more positively to her colleague’s antic yet vulnerable mania. It did occur to me however that Goerke’s approach might work better in a more “in your face” production than Chéreau’s subtle, searching vision. Goerke first performed Elektra in Madrid in 2011 and in the intervening years has sung it quite a lot along with a steady diet of the most demanding Wagner roles. Reflecting back on her BSO concert with Andris Nelsons, one couldn’t help but notice the appreciably increased insecurity on top. In general her singing lacked the repose and beauty it had then although there were still a few lovely moments in her rapt response to Orest’s return. Someone before the performance mentioned that she had also sung the “other” Mycenaean sister and indeed it was as a radiant Iphigénie at New York City Opera that I first heard Goerke in an opera over 20 years ago. That gloriously warm and noble Gluck heroine inevitably seemed lifetimes away from Thursday’s wild anti-heroine. Chrysothemis can occasionally steal the show from her hard-working sister and Elza van den Heever came close with a marvelously secure break-out performance Thursday. After occasionally wiry and caricatured portrayals of Elisabetta in Maria Stuarda and Elettra in Idomeneo the South African soprano confidently manifested Elektra’s claims as to how strong and healthy she was. Often I can’t wait for Chrysothemis’s whining to end but van den Heever’s artless and earnest conviction, while perhaps not as complexly conflicted as Adrianne Pieczonka’s two years ago, instead riveted me. Her wonderful Leonore in Fidelio at Caramoor several summers ago augured well for this soaring Strauss assumption and one now hungers to hear her in other German roles. At moments I imagined van den Heever ready to take on the big sister role in a few years. Debuting German mezzo Michaela Schuster had the hardest job in replacing the irreplaceable Waltraud Meier whose elegant Klytämnestra for Chéreau overthrew many people’s preconceived ideas of that often grotesquely drawn character. If Schuster was less glamourous and charismatic than Meier, she sang the role better with a big, rich, deep mezzo and an incisive delivery of the vivid Hofmannstahl text. There was also a subtle shifting of the dynamics of her big scene with Elektra: with Stemme and Meier it was clear that Elektra had at least for the moment “won” their battle of wills but last night it was more ambiguous as Schuster towerd over a temporarily defeated Goerke. Presumably Mikhail Petrenko was invited to sing Orest as he had created the role when this production premiered at the 2013 Aix-en-Provence Festival. Although he was a more arresting presence than Eric Owens’s inscrutable Orest had been, Petrenko sang as unimpressively as he had in Bluebeard’s Castle three years ago. Jay Hunter Morris returned after five years cast more appropriately as Aegisth than he had been as Siegfried. Looking dapper and clueless, he sang his brief role much better than his inexplicable predecessor although Morris strained at this final high notes which are usually done off-stage but here both murders were instead executed in the audience’s view. The overseer and five maids are given particular prominence by Chéreau and among them a thundering Tichina Vaughn returned to the Met after 26 years while Lisa Gwyn Daltirus made her debut as a shining, touching Fifth Maid. It may be that Goerke was just tired from long rehearsals of a relentless role in a demanding production. One hopes that future performances will find her in firmer, more secure form. Her ferocious commitment and boundless generosity as a performer are hard to resist yet one fears for her particularly when next season’s grueling Ring schedule has her performing eight Brünnhildes (two complete cycles as well as an extra Walküre and Götterdammerung) in just 17 days!